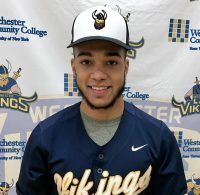 For the second time during the 2018-19 season, Westchester Community College sophomore Miles Haughton (Mamaroneck, NY/Mamaroneck HS) has been named the Mid-Hudson Conference Athlete of the Week. This time around, Haughton earned the honor after leading the Vikings to a 2-0 stretch during which the Vikings earned two crucial Mid-Hudson Conference wins. For the week, Haughton averaged 26.5 points per game, while shooting an incredible 68% from the floor (15 for 22), 70% from three-point range (7 for 10), and 89% (16 for 18) from the free throw line. For the 2018-19 season, Haughton is averaging a team-leading 20 points per game, while also contributing 6.5 rebounds per tilt, and he has added 57 assists, 41 steals, and a team-high 34-blocked shots. THURSDAY FEBRUARY 14 (Valhalla, NY) – Sophomore Miles Haughton (Mamaroneck, NY/Mamaroneck HS) scored a game-high 27 points, and added eight rebounds, three assists, and three steals. Sophomore Joe Zayer (West Nyack, NY/Clarkstown South HS) scored 21 points and had a game-high four assists, but the Westchester Community College Men’s Basketball team dropped a 73-70 battle to Region XV-leading Sullivan Community College on Thursday night at Viking Gymnasium. With the loss, Westchester falls to 15-8 overall, and 4-3 in Region XV and Mid-Hudson Conference play. Westchester needs a win on Saturday when they host Rockland Community College to clinch the #2 seed for the upcoming Region XV Championships. Westchester controlled play for a huge stretch of the game, jumping out to an 8-2 lead during the first six minutes; before Sullivan battled back to briefly take the lead, 15-14 with 9:42 to play in the first half. Later, a Jon Brennen(Irvington, NY/Iona Prep) three pointer with 5:18 to play in the first half began a 10-2 Viking run to put WCC up 35-23 with 2:17 to play in the first half. Westchester led 38-29 at halftime, as the Vikings shot 42% during the opening stanza, compared to 33% by Sullivan. However, the second half saw a major swing as Westchester shot only 24% over the final 20 minutes, compared to 47% by Sullivan, allowing the Generals (18-5, 7-0 Region XV) to make the comeback. A Haughton three-pointer with 13:35 to play gave the Vikings a 48-41 lead, and a Zayer three-pointer with 11:24 to play gave Westchester a 53-47 lead, but a 13-4 Sullivan run gave the Generals a 60-57 lead with 5:50 to play. Sullivan led by as many as six points, 68-62 with 3:14 remaining, but Westchester had one last run. A Zayer three-pointer with seven seconds to play made it a 71-70 game, but Westchester would get no closer, and the Vikings’ four-game winning streak ended. Brennen scored 12 points and added five rebounds, while Nathan Emanuel (Suffern, NY/Suffern HS) added four points and seven rebounds. Overall, Westchester shot 33%, compared to 40% by Sullivan, and the Vikings were out-rebounded 54-41. SATURDAY FEBRUARY 16 (Valhalla, NY) – Sophomore Monte Lambert (Brooklyn, NY/James Madison HS) scored 24 of his 26 points during an incredible second half of play, and added four rebounds and four assists. Sophomore Miles Haughton (Mamaroneck, NY/Mamaroneck HS) scored 32 points to go with eight rebounds and seven assists as the Westchester Community College Men’s Basketball team downed visiting Rockland Community College, 105-91 on Saturday afternoon at Viking Gymnasium. With the win, Westchester CC improves to 16-8 for the 2018-19 season after winning four of their last five games. Westchester also finished the season 5-3 in Region XV and Mid-Hudson Conference play. The Vikings led wire-to-wire despite a spirited effort from the visiting Hawks, taking a 7-0 lead, and never looking back. Westchester led 42-33 at halftime and extended the lead to 14 points early in the second half, before Rockland went on a run to bring the game within two points with 12 minutes to play. However, Lambert was outstanding during the final 20 minutes, going 8 for 8 from the floor during that stretch as he failed to miss a field goal during the game. Led by Lambert, the Vikings went on a run of their own, extending the lead to as many as 24 points before Rockland made the game as close as nine points with just over a minute to play. However, a late Viking spurt allowed the hosts to break 100 points for the fourth time this season. Also for Westchester CC, freshman Joe Zayer (West Nyack, NY/Clarkstown South HS) added 12 points and six assists, while freshman Fabian Johnson (New York, NY/Our Savior Lutheran) enjoyed a terrific all-around game with 12 points and eight rebounds. All five starters scored in double figures for WCC. Westchester shot a season-best 58% from the floor, and out-rebounded Rockland 37-35. SATURDAY JANUARY 26 AND SATURDAY FEBRUARY 16 MEN’S BOWLING The Vikings threw a 200 and a 205 baker games to finish 2nd in the NJCAA Region XV Championship. The tournament was part of the Metro Classic at AMF Babylon. Westchester finished fourth in the Metro Classic. Matthew Rush (Valhalla HS) opened the day with a 214 and went on to average 183. Rush was the Region XV All Events Runner-Up and made the All-Region Team along with Eddie Aiken (Pine Bush HS) who average 179. Rush finished third in the Metro Classic and made the All-tournament Team. Aiken averaged 209 in doubles and he and partner Matthew Rice (Arlington HS) went on to finish second in Region XV doubles. Brianna Kara (Lakeland HS) averaged 132 in the Metro Classic and went on to finish fifth in Region XV singles when she average 148 in the singles competition. THURSDAY FEBRUARY 14 (Valhalla, NY) – Sophomore Paige Collins (Jamaica, NY/Wadleigh HS) scored 12 points and added nine rebounds. Freshman Jewelle McEwan (Bronx, NY/Harry S. Truman HS) added 10 points and seven rebounds, but the Westchester Community College Women’s Basketball team saw their two-game winning streak ended with a 73-50 loss to Sullivan Community College on Thursday night at Viking Gymnasium. With the loss, the Vikings fall to 4-4 for the 2018-19 season. It was a disastrous second quarter that proved to be the culprit for the Vikings. After the visiting Generals opened up a 21-14 lead after the first 10 minutes, a 12-0 second quarter run for Sullivan put the Vikings behind by 19 points, and Westchester CC was unable to bridge the gap despite a much better second half. After trailing 41-22 at halftime, Sullivan outscored WCC 32-28 over the final 20 minutes as Westchester stepped up their play significantly after halftime. Sullivan shot 37% from the floor, compared to 34% by Westchester, and the Vikings were out-rebounded 53-44. Westchester also turned the ball over 34 times, compared to 26 for the visitors. Also for Westchester, Chynna Mincey (Bronx, NY/Business of Sports HS) added nine points, while sophomore Shanaya Jones (Bronx, NY/Health Opportunities HS) enjoyed a strong all-around game with seven points, seven steals, seven rebounds, and three assists. SATURDAY FEBRUARY 16 (Valhalla, NY) – Sophomore Shanaya Jones (Bronx, NY/Health Opportunities HS) scored 18 points, and added eight rebounds, five assists, and six steals, and freshman Jada Tom (Elmsford, NY/Alexander Hamilton HS) added 14 points, but the Westchester Community College Women’s Basketball team dropped a 65-63 heartbreaker to Suffolk Community College on Saturday afternoon at Viking Gymnasium. With the loss, Westchester is now 4-5 during the 2018-19 season. 25 days after falling to the Sharks 28 points, Westchester gave Suffolk all they could handle, and then some. Westchester led 40-36 at halftime, and the two teams went back and forth until the closing seconds of play. The Vikings had multiple opportunities to tie the score at the closing buzzer, but the ball rimmed out, and Suffolk escaped with the win. Chynna Mincey (Bronx, NY/Business of Sports HS) added 10 points and five rebounds, while Paige Collins (Jamaica, NY/Wadleigh HS) chipped in nine points, nine rebounds, and three steals.